Crochet is such a popular craft, particularly for the holidays. I remember when I was younger going to craft fairs around Christmas and there would always be hand crocheted items there in so many styles and designs. I have loved crocheting since I was a kid and adore finding new patterns to try out. Personally, I think crocheting and Christmas go hand in hand. 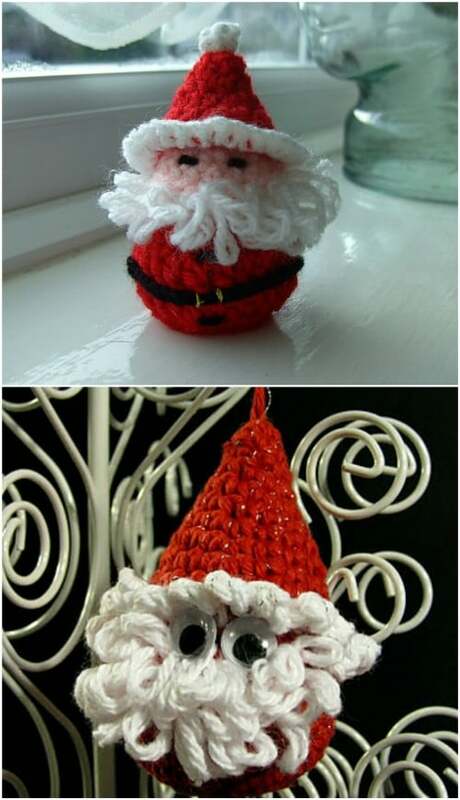 Whether you are creating something as a gift or you want to add some down home country charm to your home this Christmas, crocheting is the perfect solution and I have a list of 30 beautifully easy crochet Christmas ornaments to get you started. 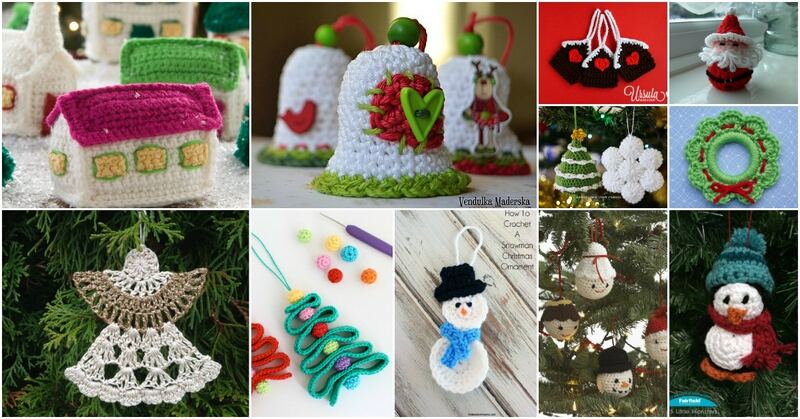 All of these DIY crochet Christmas ornaments can be done long before Christmas. They are so easy to do and will give you a wonderfully rustic looking Christmas tree. Or, you can use them to decorate anywhere I the house that you want to add some homemade charm to your décor. Whether you’re a seasoned crochet master or just getting started, you’re going to find some wonderful crochet ornaments that you can create easily and quickly. 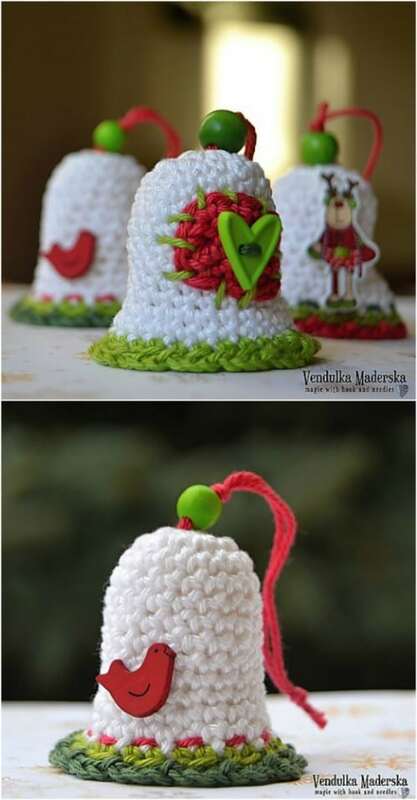 And, if you are looking for homemade gifts to give out this Christmas, be sure to take a look at these 100 crochet patterns that are perfect for beginners. I love making homemade things, particularly around the holidays. There’s just something about relaxing on cold evenings with my crochet hooks in hand and creating beautiful gifts for family and friends. I also love doing my own crochet décor and if you do too, you have to check out these beautiful crochet roses that you can use to decorate so many things. I hope you enjoy these crochet Christmas ornament patterns and I hope they keep you busy right through the holidays making beautiful things to add to your Christmas décor. These are the most adorable little ornaments! And, they’re all easy to crochet even if you’re a beginner. You can do these in Santa, Mrs. Claus, and angel or a snowman or do them all. The patterns are listed as easy and you don’t need to know any complicated stitches. They’re so easy that you can knock one out each day so you have time to fill your tree and even make a few of these for gifts. 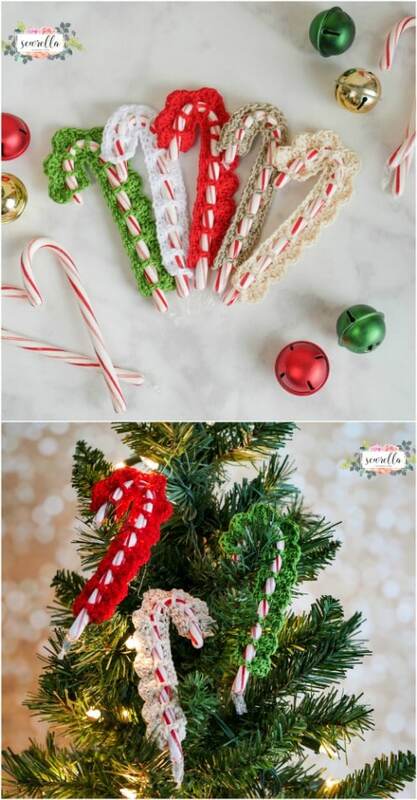 I love putting real candy canes on my Christmas tree every year but I’ve never thought about adding crochet candy canes. This pattern is so easy that I might just mix it up this year and add a few of both. You can easily finish one of these little candy canes in an hour or so and they make wonderful additions to your Christmas gift packaging. This gorgeous little bell has such a wonderful retro look to it and it’s super easy to crochet. Do this in different colors or you can make them all white if you prefer. I love how simple they are and you can embellish with any number of things from buttons to wooden or plastic ornaments. These retro lights will look beautiful on your tree and they’re particularly helpful if you’re looking to create rustic farmhouse Christmas decorations. They look just like those large bulbs from years ago and they’re pretty easy to crochet. You can do these in multiple colors to make your tree look retro or choose one color to make it more uniform. You could even hook them together to create a lovely retro looking garland. 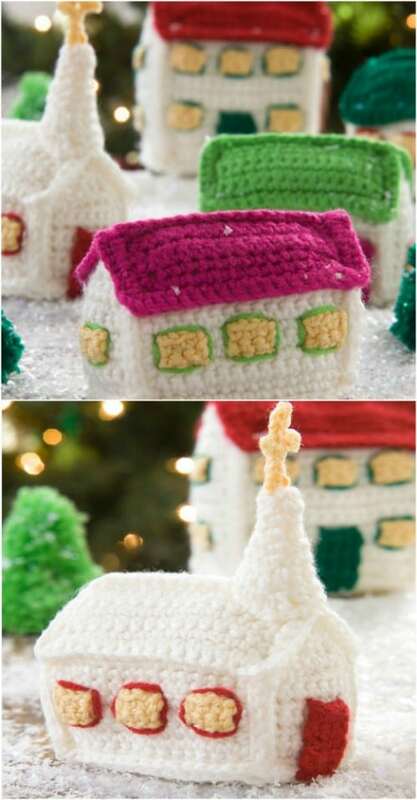 You can crochet these Christmas village pieces to hang on the tree or to put on the mantel or a side table for decorating. They’re pretty easy and there are a number of different buildings that you can create. You can do these in all white or get really creative and make them in a number of different colors. I found the pattern on Etsy and it’s a super easy one to follow. I have a few of these little angels that someone crocheted for me years ago and I still love them today. These are pretty easy to make and you can do them in any number of colors or combinations of colors. Add a few of these to your Christmas tree to get a lovely vintage look or make up a few for gifts. 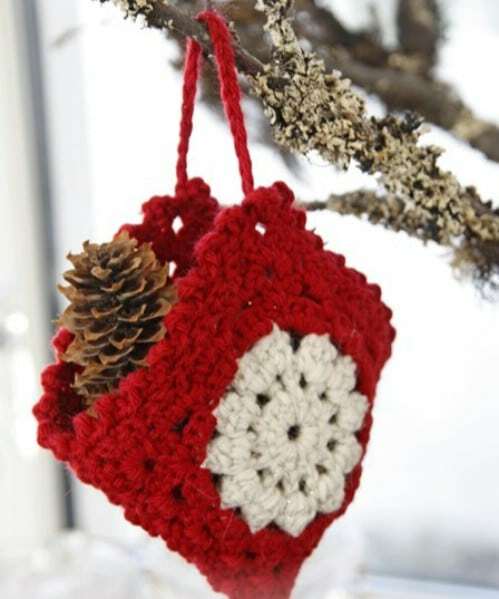 This little Christmas bag is easy to crochet and it’s the perfect addition to your indoor or outdoor Christmas tree. Fill it with pinecones or even candy and hang wherever you want to add a little extra Christmas décor. You don’t need to know any complicated stitches and if you’re not comfortable switching yarn colors, just make it all one color. 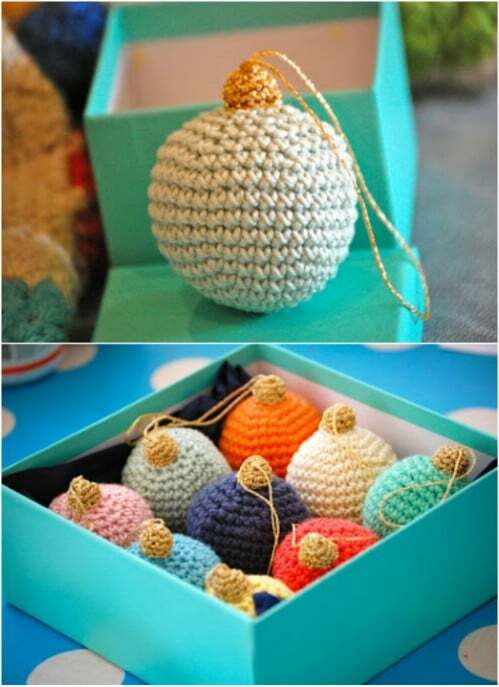 These little crocheted ornaments look like something right out of the 70’s and they are pretty easy to make. You could do these separate and hang them on the tree or create this lovely garland that is perfect for adorning the mantel or anywhere you need to add a bit of festivity. The great thing about this one is you can make as few or as many ornaments as you want to add to your garland. 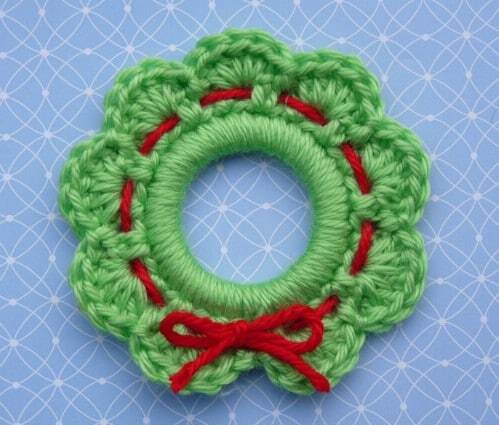 Here’s another wonderful retro ornament garland that you can crochet in a weekend. This one looks like those really old fashioned ornaments that had longer tails and you use yarn tassels to create that look. 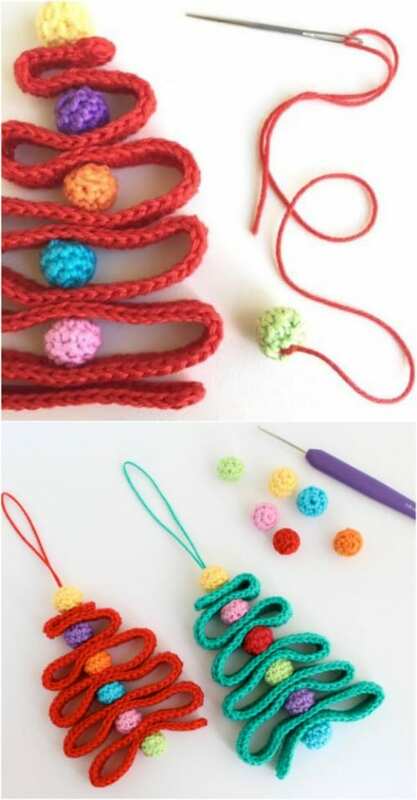 This one is also pretty easy and you can have several ornaments ready to tie together in just a weekend. 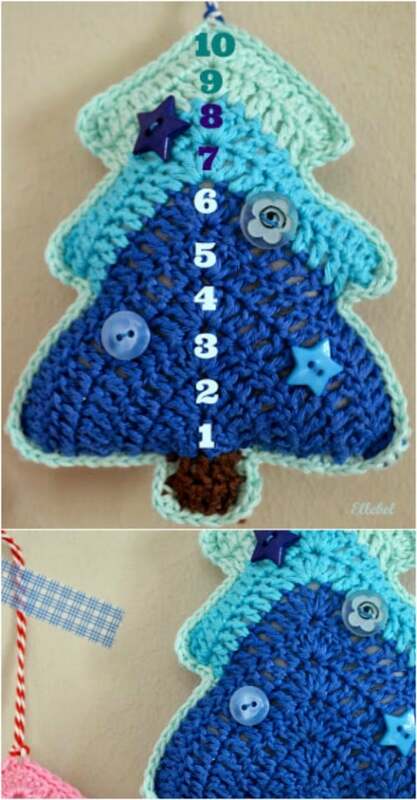 This little ribbon DIY Christmas tree may be the easiest thing that you crochet this season. 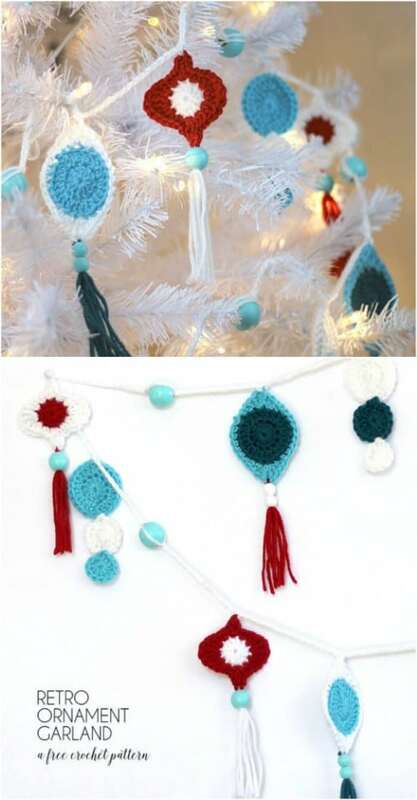 To make it, you simply crochet strips of yarn and then tie them all together with beads which act as your ornaments. You can use any weight of yarn that you want and these are honestly so easy that you can create several in an afternoon. I love putting candy canes on gifts…it just adds that extra special touch when I’m wrapping. 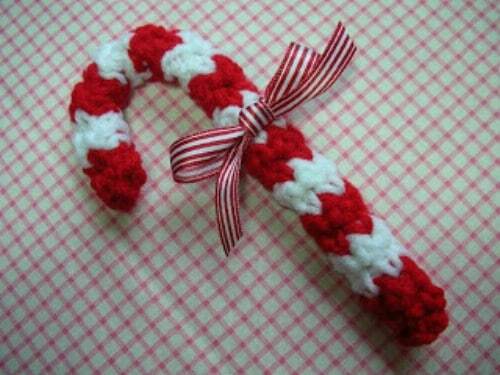 These little crochet candy cane covers are perfect for that or you can use them to cover the candy canes that you put on your Christmas tree. These are really easy to crochet, even for beginners and won’t take longer than an hour or so each. This little Santa can be an ornament for your Christmas tree or you can use him as a gift tag. He’s pretty easy to make and only takes a bit of yarn. You do need to be comfortable working with different colors to do this one but it’s not difficult and the little bell on the end of his hat is the best thing I’ve seen. You can make DIY Christmas trees out of so many things. 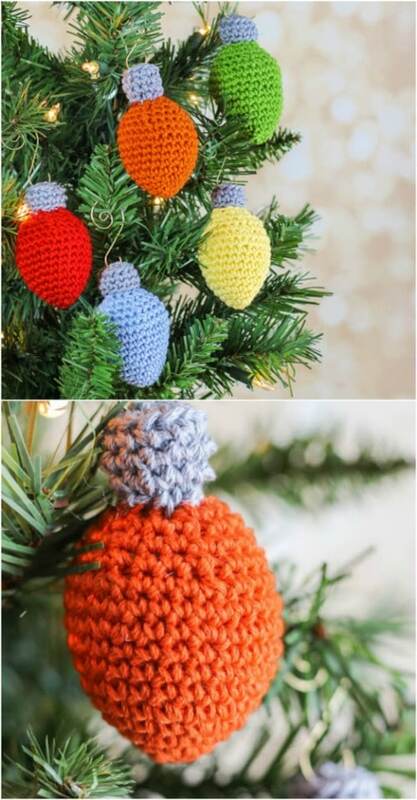 Do these little crochet Christmas trees in all sorts of color and hang them all over the house. I think you could also increase the pattern just a bit and make these into adorable little potholders, which are perfect for gift giving. 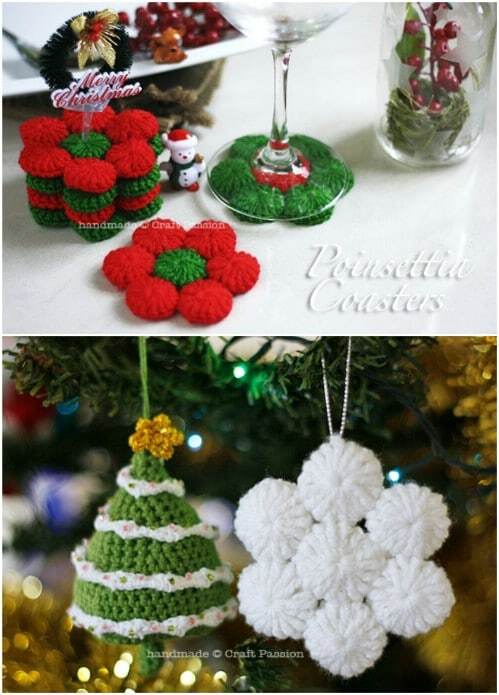 Buttons and other items embellish them and act as ornaments on your little trees and these are really easy to crochet. Here’s a great twist on a traditional snowman. 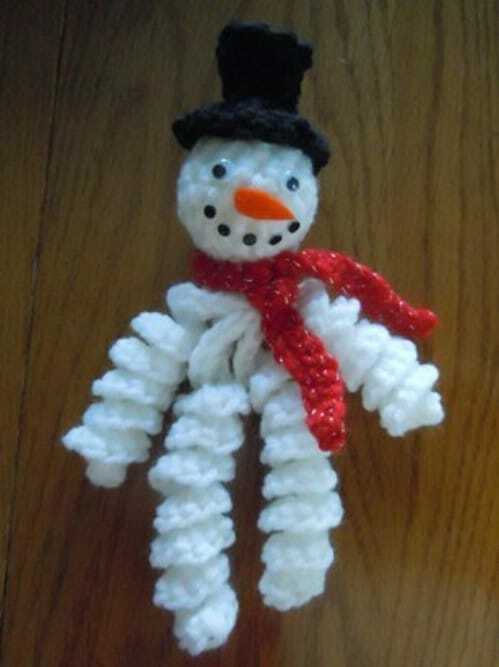 This curly snowman is not only unique, but he’s really easy to crochet. Once you have the hat, head and body crocheted, you simply add google eyes and other embellishments to turn him into an adorable snowman. And, you only need to know single, double and slip stiches as well as chain stitching to make this one. These little ornaments look just like the bauble ornaments that you place on your tree each year and they’re super easy to make. You can do them in any number of color combinations or just one color if that’s how you decorate. These would also make wonderful gifts. Just put them in a box like you would regular ornaments and make someone’s holiday. 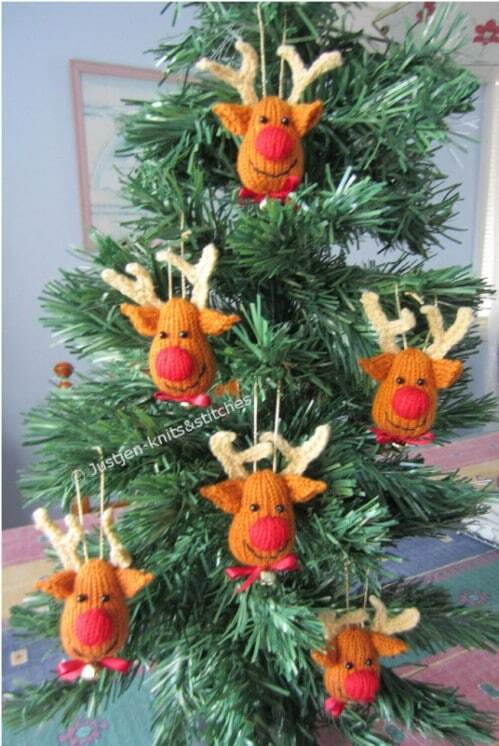 Rudolph The Red Nosed Reindeer is my favorite Christmas character and I just love these little Rudolph crochet ornaments. These are pretty simple to make and fairly small so you can knock off several of them in a weekend. Get started now and you will have more than enough to fill your tree and give out a few as gifts. These little snowflakes make me think of my grandmother’s Christmas tree. It was always filled with crocheted ornaments and these were always among them. 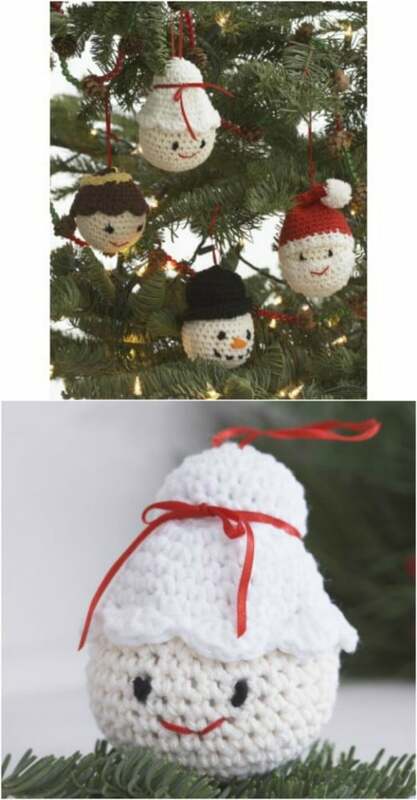 If you’re looking to create cheap and easy Christmas décor, these are a good choice and they are super easy to crochet. You can do them in all one color or add contrasting colors and different tones to make them really stand out. 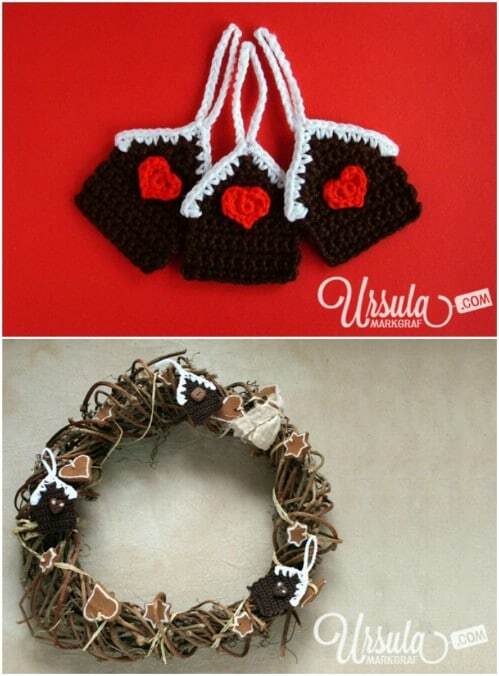 Give your gifts a little something extra with these crochet gingerbread house gift tags. 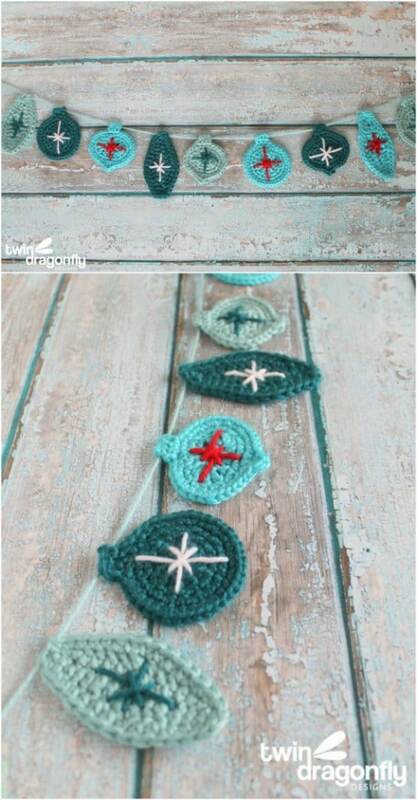 These aren’t even difficult to crochet and the details are stunning. 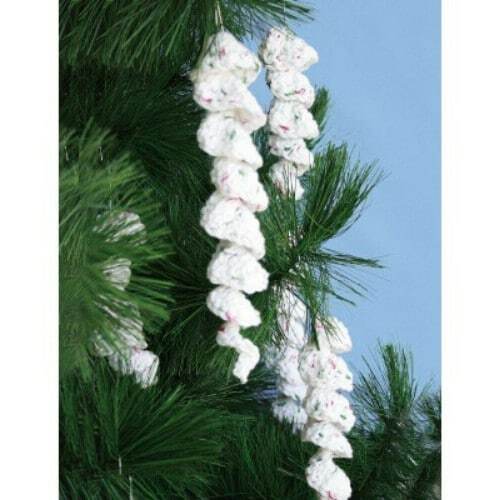 You can hang these on the tree or use them to embellish your gifts or even your holiday wreath. You can make several of them in an afternoon, that’s how very easy they are to crochet. 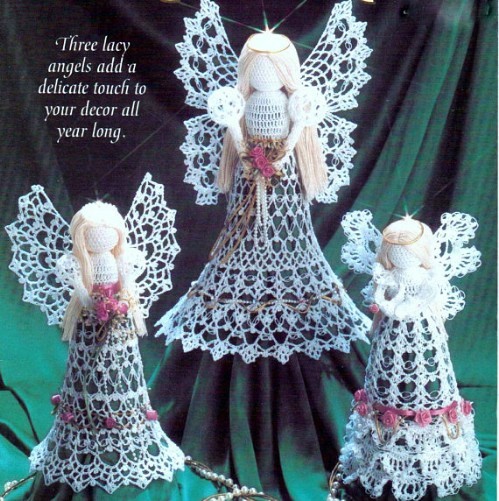 This vintage looking angel would be perfect sitting atop your Christmas tree and she’s pretty easy to crochet. You can use this as a tree topper, a tree ornament or for placing on the mantel or anywhere else that you want to add a bit of vintage Christmas décor. I found this pattern on Etsy and it looks super easy to follow. Make one for yourself and several to give away to friends and family! Make your own gingerbread family that you can use to decorate any number of things. 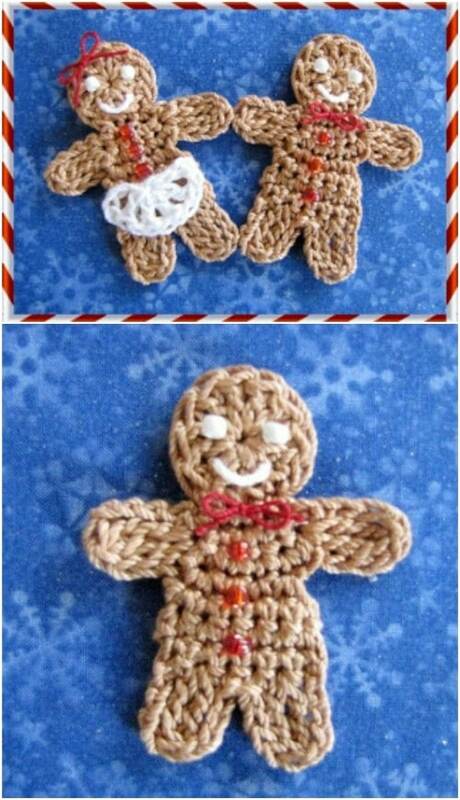 The pattern for these crochet gingerbread people is so easy to follow and these won’t take you long at all to work up. Create an adorable little gingerbread couple or make several of these for an entire family to adorn your Christmas tree. They’re also really cute hanging on wreaths. 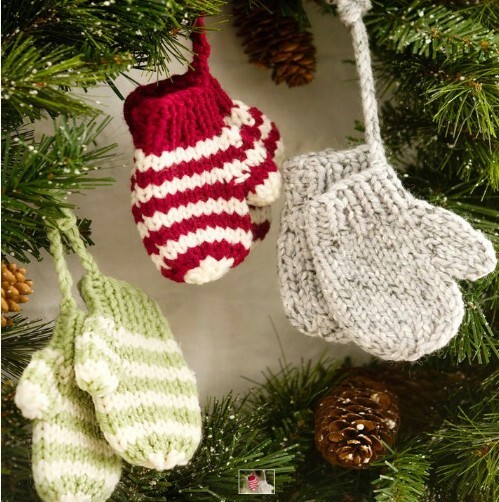 You simply have to have little DIY mittens hanging on your Christmas tree, especially if you are planning a rustic country look for your Christmas décor. These tiny mittens are super simple to crochet and they won’t take you long at all to work up. You could make several pairs of these between now and Christmas decorating time so you’ll have plenty for your own décor and a few pairs to give away as gifts. Oh my goodness these little crochet penguins are so adorable! And, they’re pretty easy to work up. 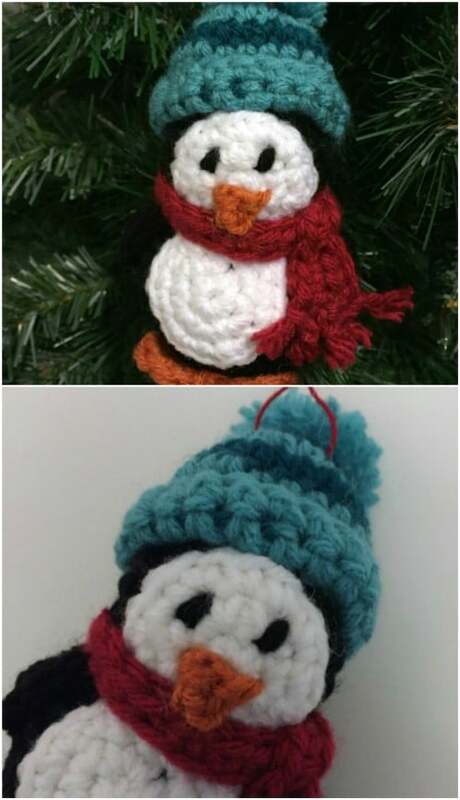 You can actually use a similar pattern to make these little penguins or add a snowman or Santa Claus. 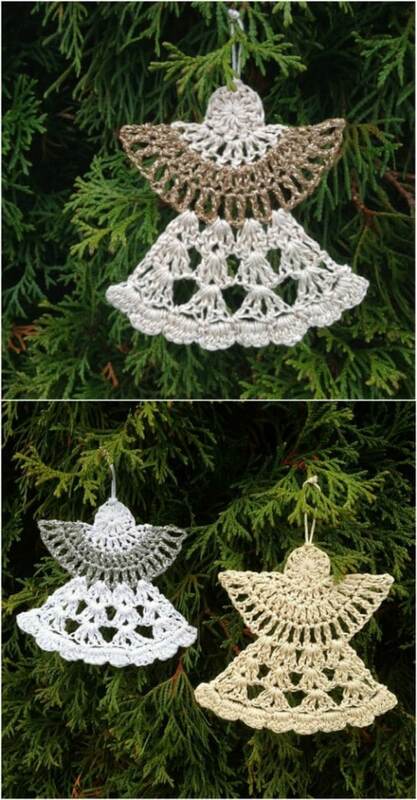 If you are planning to decorate your tree in all crocheted ornaments, these patterns will help you to do that. These little crochet reindeer ornaments have such a whimsical face. They’re smiling, because they know how very easy they are to crochet, even if you are beginner. And, there’s a bonus here. You can use this same pattern to create a wonderful coffee mug cozy with this cute little reindeer face. What a wonderful gift idea for someone who loves coffee…and reindeers! Use this little Santa pattern to create an adorable cover for chocolates and other candies, or you can hang him on the tree as is. This one is pretty easy to crochet, and his little beard is made from looping thread through the pattern. Although he has a few more embellishments than some of the other crochet ornaments on the list, he’s still really simple and pretty fast to work up. 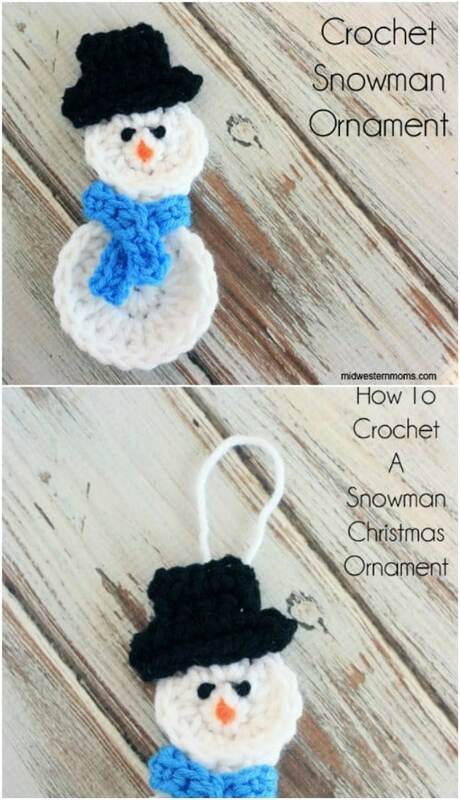 If you want something really simple, this little crochet snowman is it. You can work this up in under an hour even if this is the very first time you have ever tried crochet. This one is less three dimensional, which means there is less work and he’s super easy to make. He is perfect for hanging on the tree or using as a gift tag embellishment. Not all of the ornaments and DIY Christmas decorations that you will make are going to be for your tree, right? These poinsettia coasters are the perfect addition to your holiday décor and they make wonderful gifts, as well. You could even hang these on the tree if you are so inclined. They’re perfect no matter where you use them to decorate. I love these spiral icicles that remind me of the ornaments we had when I was a child. These are super easy to crochet and honestly, you can turn out several in an afternoon. You just have to work up a few rows for each icicle and the stitches are so simple. You don’t need to know any complicated crochet stitches to make these. You just can’t do a DIY crochet Christmas ornament without having the Grinch, right? 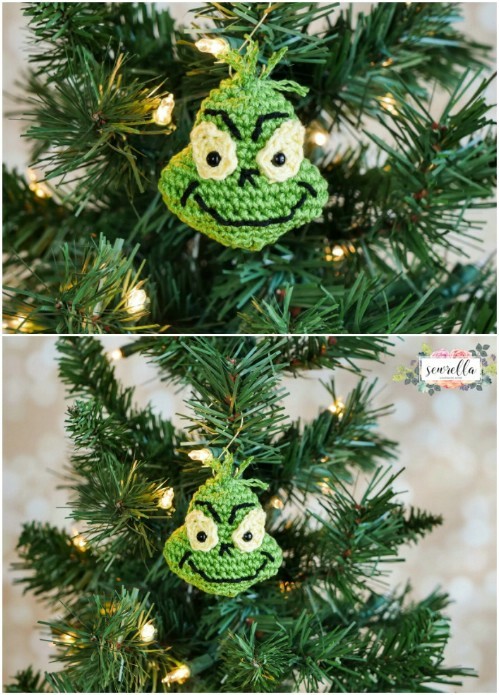 I love these little Grinch inspired ornaments and they are really easy to crochet. 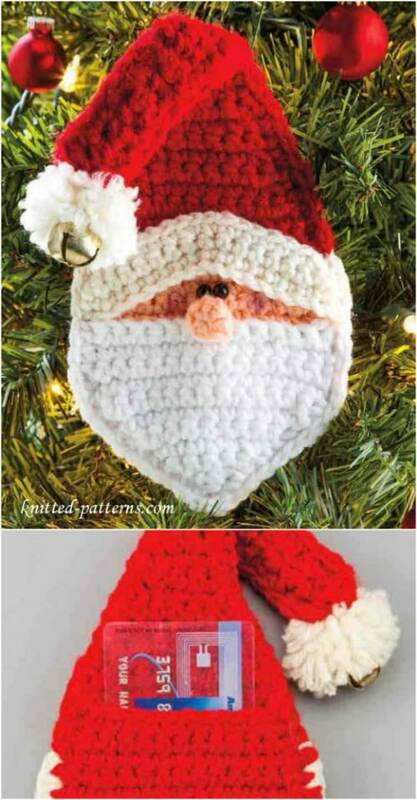 You’ll need to crochet in the facial features, so these may take a bit more time but they are super easy and they’re just perfect for adding a Grinchy tone to your holiday decorating. create a tiny wreath garland or for adding extra decorations to your Christmas gifts and packages. 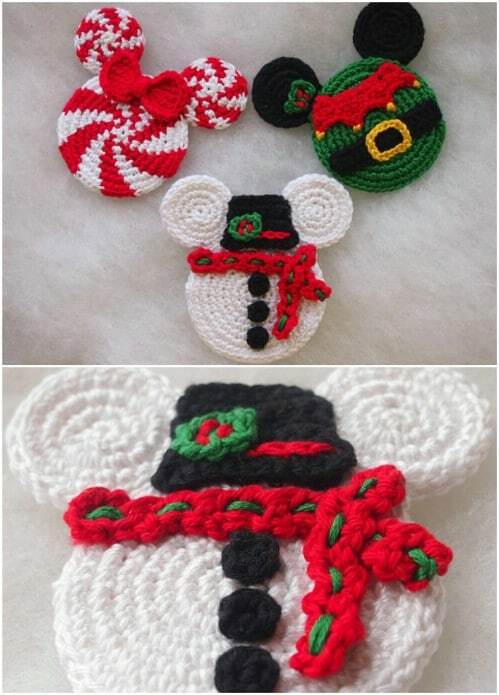 If you have a Disney lover in the house, these little crochet Mickey Mouse ornaments are a must. They’re super easy to crochet and you can do them in a number of different colors and designs. I found this pattern on Etsy for just $4 and you get all of the ideas that come along with it for customizing your Mickey Mouse just how you want it. Number 21, the Tiny Crochet Mittens Ornaments is a knitting pattern.